We’d love your help. Let us know what’s wrong with this preview of I Wish My Teacher Knew by Kyle Schwartz. To ask other readers questions about I Wish My Teacher Knew, please sign up. I received this on a read-to-review basis from NetGalley. Thank you to the author, Kyle Schwartz, and the publisher, Da Capo Lifelong Books, for the opportunity. This is a set of essays formulated in response to one teacher asking her students the question, 'I wish my teacher knew _____.' The responses she gathered, all that she learned and the wide-spread fame of the assignment shocked her, and this is the amalgamated copy of the various things she acquired, read and gained from the experiment. T I received this on a read-to-review basis from NetGalley. Thank you to the author, Kyle Schwartz, and the publisher, Da Capo Lifelong Books, for the opportunity. This book is aimed primarily at teachers and, as I am not one, I feel my rating might then be a little harsh: I certainly would have found this even more highly instructive and enjoyable if I had been in the said profession. Whilst still enjoying seeing the positive outcomes and learnings garnered from the enquiry, I found that I preferred seeing the students responses more, rather than what could be learnt from them. This was unfortunate as they were often indecipherable in the e-book format, as the text used for them was a pale gray that almost blended in with the background colour of my Kindle. I found this formatting mistake to be inexcusable, in this ARC, and hope that it has been rectified once published. When Kyle Schwartz asked her elementary students to complete the sentence "I wish my teacher knew...", she did something extraordinary and her students rewarded her with their honesty. "I wish my teacher knew I didn't have pencils at home to do my homework", wrote one little girl. Soon enough, Kyle had set her mind to addressing all of the issues faced by her students. 1. Help you to increase learning inside your classroom. 2. Help you to foster a sense of community inside your classroom. 3. Help you to provide a more inclusive and supportive environment inside your classroom. At the core of Kyle's approach lies a simple statement, made by child psychologist James Comer, that "no significant learning occurs without a significant relationship" and the belief that every child matters. She outlines and tackles real issues that face many of our students - food hunger and bereavements, for example - and her practical suggestions cover everything from how to welcome new children into your classroom, to holding 'family-school conferences' instead of a traditional 'parents night'. If you're a teacher, you will benefit from reading this book and you will enjoy reading it! (I predict several eureka moments and lots of head nodding...) It doesn't really matter which country you live in, or what age range you teach there, as the issues our students face are the same. All of my teacher friends will be getting copies of this - from me! - for Christmas. I Wish My Teacher Knew by Kyle Schwartz is not the book I expected. The publicity for the book implies that the book is about student responses to the author's question. It's not. Rather, this book is research, case studies, and techniques for elementary teachers. In addition, the format of the ebook makes for difficult reading. On the other hand, if the book impacts even one teacher's ability to teach one student, it will change a life for the better. And, for that, I wish it success. Read my c I Wish My Teacher Knew by Kyle Schwartz is not the book I expected. The publicity for the book implies that the book is about student responses to the author's question. It's not. Rather, this book is research, case studies, and techniques for elementary teachers. In addition, the format of the ebook makes for difficult reading. On the other hand, if the book impacts even one teacher's ability to teach one student, it will change a life for the better. And, for that, I wish it success. Thanks to NetGalley for sending me an e-Arc of this book. Although I Wish My Teacher Knew: How One Question Can Change Everything for Our Kids revolves around one teacher's experience in the US classroom, there are plenty of universal themes that ring true in education. One of the most important elements is that it is important to make a connection with each and every student that enters your classroom. A highly engaging teacher tool that wasn't too "textbookish!" I wasn't sure what to expect with this book. Of course, I had seen the articles around the time the "I Wish My Teacher Knew" exercise went viral, so I was curious as to what would be in a book by the same teacher. Thankfully, the book goes a bit beyond that exercise, and it focuses on building strong classroom communities. There is a good bit of research involved, as well, on what today's students are likely dealing with outside of school. 1. Welcome and Farewells: Building Commun I wasn't sure what to expect with this book. Of course, I had seen the articles around the time the "I Wish My Teacher Knew" exercise went viral, so I was curious as to what would be in a book by the same teacher. This chapter explores how mobile today's students are and gives tips and strategies for ways to make new students quickly feel at home, as well as ways to ensure leavers know they will be missed. I especially liked the idea of welcome kits. Because I teach in an international school, we have a slightly higher rate of turnover amongst our students, and the welcome kit is something easy to do that can make a difference in how the student feels immediately upon entering the school. So many of today's students are living in conditions at or approaching poverty. This chapter not only covers the statistics but also gives strategies teachers can use to help kids who may be in this situation. Many teachers may not be aware of how many of their students struggle to get enough to eat each day because the students often have developed coping strategies or methods to hide their circumstances. The idea of a food drawer is a great one, as is having sets of community supplies rather than requiring all students to provide their own. Families today are becoming less and less "traditional" (mother + father + kid(s)), and we need to be aware of that as teachers. I found the reminder to use more inclusive language, such as saying "Families" instead of "Parents," to be helpful. Even just asking students to identify their family groups can give teachers a better understanding of their students' lives. Good stuff. This chapter focuses on the idea that children can grieve for a variety of reasons, not just a death, and that their grief can have a significant impact on their learning. It helpfully identifies signs of grief so that teachers know how to recognize it in their students. I found this incredibly helpful because my students have often had to leave behind their home country, friends and family, so I should expect them to grieve that loss and see signs of that grief in their work or approach to learning. Thankfully, the chapter also gives strategies teachers can use to support students as they experience grief or loss. Teachers have the responsibility of observing students and questioning and/or reporting any mistreatment of the children in our care. We need to be aware that there are likely students in our classes that have experienced trauma. This chapter identifies signs of abuse so teachers know what to look for, and it also gives more strategies for how to ensure that students feel safe in your classroom. I liked the reminder to only make promises I know I can keep, and found the examples of these types of promise quite helpful. Character education is a big part of what my school is focusing on currently, so I found this chapter incredibly relevant to my current teaching. I took copious notes and can't wait to begin integrating some of the teacher tools from this chapter into my current practice. Who hasn't heard of growth mindset and grit? Get thee to a library immediately if those are unfamiliar to you, and check out anything by Carol Dweck or Angela Duckworth. This chapter explores these two ideas, together with optimism (Martin Seligman makes for some good reading on that one), and gives concrete tips for helping students to develop in ways that encourage them to accept learning as a challenge and to stick with it when it gets tough. This chapter is all about engagement and its importance to learning. Finding ways to hook students into the lesson or topic can greatly increase the learning they experience. There are some good ideas here, but this chapter is part of why I only gave 4 stars instead of 5. It doesn't seem as well-developed as the others. It still has some useful information, though. At the end of the book, you will find a Teacher's Guide to exploring "I Wish My Teacher Knew" with your own students. This can be helpful if you struggle with building a close classroom community. I found the book to be a helpful resource overall. The other reason I gave 4 stars instead of 5, though, was that this book tends to focus primarily on the elementary or primary years. While some of the tips and strategies can be easily adapted for older students, some of them just wouldn't work. The research is useful, though, and this book provides a good reminder of just how many different issues our students may be struggling with outside of school. Thought-provoking and with plenty of relevant advice. The style of the writing makes it easy to read. The character of some of the real examples shared, often heartbreaking, made it quite hard to read. A book worth reading by teachers of any level! I loved this book. I will keep it as one I plan to reread in the summer. Note a ton of new information but many good reminders for buildings relationships within the classroom. The bad: Formatting: I got this book a This is fantastic book that every single teacher should read. It starts off explaining the project the author came up with for her to get to know her students better. It then goes on to explain the number of things the students had to say and how they're very important for a teacher to know to properly teach and engage students. It's well researched, clear, and has lots of personal examples. My only issue with this book, had nothing to do with the writing. The title of this book should actually be changed to "The Things All Teachers Should Know". I really think that everything Kyle Schwartz put in this book is absolutely essential to every single teacher, classroom, and administrator...no matter what teaching philosophy you have, or how many years you've taught. If anything, this book would be a great refresher to read every year to get ready for the next. I wish I would have read it in college - it would be a great introduction to teaching textbook for preservice teachers as well. 0 We should not be our kids' friend - but we should ALWAYS make a point to be their allies. "In an age of teacher and school accountability, we are missing the something if we don't teach our students that they are the ones who need to take ownership of their own learning." 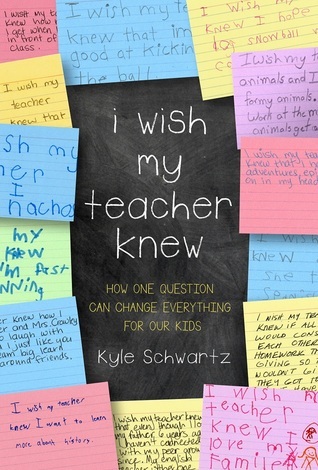 I Wish My Teacher Knew by Kyle Schwartz is a must read for all teachers. The book is a set of essays based from student responses to the question "I wish my teacher knew___________." The teacher asked her questions the above question and the information she gathered from the assignment shocked her but helped to gain necessary information from her students about them. The book begins by explaining the project that the teacher/author created in order to get to know her students better. The author I Wish My Teacher Knew by Kyle Schwartz is a must read for all teachers. The book is a set of essays based from student responses to the question "I wish my teacher knew___________." The teacher asked her questions the above question and the information she gathered from the assignment shocked her but helped to gain necessary information from her students about them. The book begins by explaining the project that the teacher/author created in order to get to know her students better. The author describes what students said that the teacher needed to know in how to properly teach/engage the students. Beyond knowing how to effectively teach students a teacher needs to be aware of issues that students may be experiences. The book states that it is important to know how to deal with these issues because if the issue of death, homelessness, family issues are causing issues for a student it will be difficult for a student to focus on their studies. These issues are just as important at learning in the classroom. As a teacher I found this very true. In addition to knowing how to effectively engage student based on their learning styles, the book also states that as a teacher it is important to know the students hobbies/ interests. The book is thoroughly researched which is valuable to any person who is going into the field of teaching or has been in the field for many years. As a 2nd year teacher I found the book very interesting. I plan to do this as a first activity with my students to learn about them. The activity is a way to get to know your students without pre-judging their personalities. It is a stress free way for students to share important information. This is fantastic book that every single teacher should read. It starts off explaining the project the author came up with for her to get to know her students better. It then goes on to explain the number of things the students had to say and how they're very important for a teacher to know to properly teach and engage students. This book goes through issues that students may be going through, such as a death in the family, homelessness, and such, and research that's been done as well as tactics she's found helpful. But this book also mentions that it can be just as important for a teacher to know a student's interest or hobby as they can then use that to motivate students. So many important discussions are brought up in this book. It's well researched, clear, and has lots of personal examples. My only issue with this book, had nothing to do with the writing. I received an early e-book copy, which messed up the format of this book. That meant that I couldn't see pictures properly and that paragraphs would sometimes be mixed together. That therefore made it hard for me to get a proper look at this book, and thereby lessened my enjoyment. But I'm sure that by the time the book is published these errors will have been fixed and those who read it will be able to properly enjoy it. I cannot recommend this book enough to anyone who works in education. It's an important and thorough look on addressing difficult issues in the classroom. The format of this book is poorly done which makes it very hard to follow in some places. It reads like a textbook, but instead of the "box" off to the corner of side, it's right in the middle of the paragraph. Which breaks up the paragraph and causes the reader to have to go back to figure out what's going on. I'm not sure if this is because it's an ARC or if that's how it's going to read as an e-book. Another way it reads like a textbook is that there are so many facts and figures. I do appreciate the knowledge, but the way the author wrote it made it sound so technical and boring. I was expecting more of a Post Secret or People of New York type book. Except, there were no post cards. The same "I wish my teacher knew" cards were repeated over and over again. I thought the book would be filled with them. I honestly felt like I was back in school doing homework. Also, the author pats herself on the back a bit too much. Yes, she did some great things. But so have other teachers without bragging about it. And that's the feeling I got reading this book. I thought being an educator was a team effort. She made it sound like she single handedly did everything by herself. The writing style is very pretentious. Some of the stories feel unrealistic and unbelievable. And the ideas just seem far fetched. The education system is already stretched as far as it can go, with more and more cuts being made every day. The most recent book I read was I Wish My Teacher Knew by Kyle Schwartz. I’m not a teacher, but I really liked this book. I Wish My Teacher Knew is a book about how you, as an educator (in any role, I don’t believe you have to be a teacher only), can show your students that you care about them and that they matter. It had some thought-provoking ideas on how you can get kids engaged in your classroom. 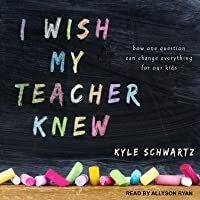 Not just with learning, but also when new students arrive and current ones leave, how to involve The most recent book I read was I Wish My Teacher Knew by Kyle Schwartz. I’m not a teacher, but I really liked this book. I Wish My Teacher Knew is a book about how you, as an educator (in any role, I don’t believe you have to be a teacher only), can show your students that you care about them and that they matter. It had some thought-provoking ideas on how you can get kids engaged in your classroom. Not just with learning, but also when new students arrive and current ones leave, how to involve your students’ family and getting the students excited about something, anything are some examples. The explanations, studies and stories Kyle gives for each chapter/section were interesting and made me think about how most of these can be easily implemented in ones own classroom. I definitely recommend this book to others, especially if you are a teacher or work with kids/students in a learning environment. What happens when one assignment changes everything you thought you knew? I got this book as an ARC so I am not sure how it will appear once published but the ARC has grey areas and normal print areas and pictures are usually hard to read or just black squares. The formatting overall was What happens when one assignment changes everything you thought you knew? I got this book as an ARC so I am not sure how it will appear once published but the ARC has grey areas and normal print areas and pictures are usually hard to read or just black squares. The formatting overall was TERRIBLE! oh some of these are heartbreaking!!! I wish my teacher knew I love nachos! A touching portrayal of a teacher who brings inspirations to the lives of her students. That's what happen when your teacher cares about you. Read more on The Serial Reader Blog. Ok, this review isn't because I thought the book was bad or didn't have some good points, but what he wrote and presented throughout was nothing new. Any good teacher that went to a college with a solid education program and continues to want to learn throughout their career has heard these tips many times over. I will say that, fresh out teacher or students learning to be teachers might value the book because it does give some good tips for younger grades and fairly short. The other problem wit Ok, this review isn't because I thought the book was bad or didn't have some good points, but what he wrote and presented throughout was nothing new. Any good teacher that went to a college with a solid education program and continues to want to learn throughout their career has heard these tips many times over. I will say that, fresh out teacher or students learning to be teachers might value the book because it does give some good tips for younger grades and fairly short. The other problem with this book was it is almost false advertisement. I, like most people, was expecting to read a book of the responses to the "what I wish my teacher knew" prompt, but instead I got a book about creating a positive classroom climate. Creating a positive classroom climate is important, I just didn't think it was going to be the point of this book. Also, honestly, the strength of this book lies in the couple of responses we did get. **This book was reviewed for Perseus, De Capo Press via Netgalley. Schwartz’ poignant book is a testimony to the impact and power a teacher has. Rather than going through the mere drudgery of teaching, day in, day out, Schwartz went out of her way to really get to know her students. Teachers really play the role of psychologist and sociologist, in addition to their 'job’ of passing along information. Kids of all ages have myriad problems most people either don't know, or don't care about, but tho **This book was reviewed for Perseus, De Capo Press via Netgalley. Kids of all ages have myriad problems most people either don't know, or don't care about, but those problems, and lack of a positive outlet of release, can lead to all manner of behavioural issues. Children look up to teachers as mentors, and all it takes is one to pay attention, and genuinely care to make a difference. Throughout this book, Kyle illustrates this again, and again, with many different issues. Specific examples of students’ “I wish my teacher knew…” are given, but if you are expecting the whole book to be that, you are destined for disappointment. There are anecdotal stories I found more fascinating than the kids’ submissions, mainly because of the difficulty I had reading the photocopies of the on the Kindle. I was lead to believe that the book would be about the question, 'I wish my Teacher Knew' and that the book would have the answers to how the students answered the question. What it ended up being like is every 3 or 4 pages there would be that particular question and the answer and the rest of the book was the author/teacher explaining how to be more effective in the classroom with a variety of students. And explaining the courage it took for some of the students to even answer the question. The I was lead to believe that the book would be about the question, 'I wish my Teacher Knew' and that the book would have the answers to how the students answered the question. What it ended up being like is every 3 or 4 pages there would be that particular question and the answer and the rest of the book was the author/teacher explaining how to be more effective in the classroom with a variety of students. And explaining the courage it took for some of the students to even answer the question. There were some good ideas on how to work with students in the classroom that could be taken into life situations but that wasn't really what I was looking for. A very helpful resource - for myself, being a new teacher, it had many thought-provoking and note-worthy ideas. However, it was VERY USA based, and as a Canadian I found that it was quite hard to relate to many situations discussed in the book. Not exactly what I expected, however still appreciated the ideas. Likely the most valuable piece of the entire book being the last four pages where you're given ways to incorporate the "I wish my teacher knew" activity into your classroom. I discovered this teaching idea on social media and bought the book to learn more about it. The book, while interesting, did not reveal as much about the author's experiences with this teaching idea as I had hoped. As a veteran teacher, most of what was covered was common knowledge to me. BUT~a novice teacher would learn a lot and it would help shape his/her viewpoint on teaching the "whole child". The concept is awesome. I don't think the book itself is a must-read for (current) teachers. I feel like the title of each chapter (and the concept itself) is enough - I did not need to read an explanation of each example...I have learned a lot of this already just from teaching. This book might be better for student teachers or those considering teaching. But again, the concept is great and something I want to try with my students. *I received an eARC of this book from the publisher through NetGalley. My eARC was a little hard to read at times, the formatting didn't show properly on my kindle and the personal stories sprinkled throughout the novel were "printed" in a lighter font color, making it very difficult to see. Difficulties aside, I thought this was a practical book filled with both anecdotes and actual research. Recommended reading for all teachers! I thought this book would be more about the responses given. While it wasn’t, and I was a little disappointed about that, it still contained excellent content. I think every educator should read this. It gives great insight into the challenges that our students face. It also has several great ideas to build communities within the classroom. There was a lot of content in this book that I was already familiar with. Adverse childhood experiences effect many of the youth that we serve. Listening skills are one of the most important attributes of any educator. There were case studies from throughout the U.S. and other countries. It is an excellent resource book also. This book is more geared towards elementary aged children. Which is great. I was looking for something more on the level of high school at- risk aged teens. However, it had a lot of great ideas. Especially for first year teachers at the grade school level. Though I love the activity with my class and truly believe in the purpose behind the book, I felt overall the read was a bit redundant. Like, it would have made an incredible blog post, but in my opinion it was less impactful as a book. Great work and great philosophy though!